Lilly King Puts Exclamation Point On Big Day For U.S. Swimming : The Torch "I'm proud to be competing clean and doing what is right," Lilly King said after the race. Over the weekend, her top rival, Yulia Efimova, was reinstated. 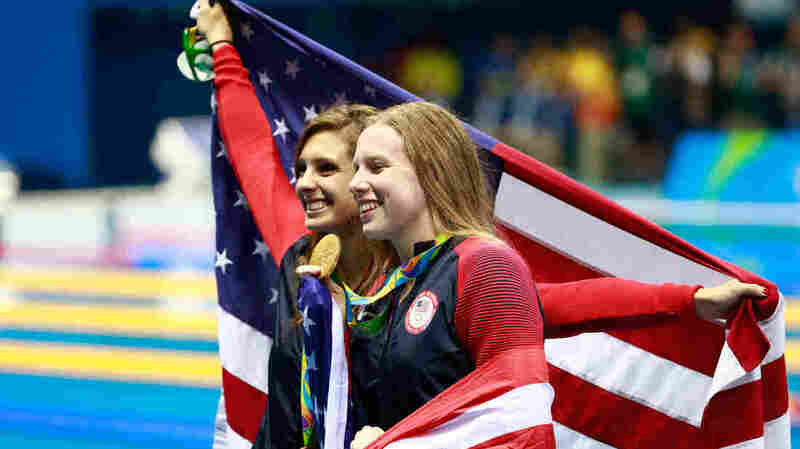 Gold medal winner Lilly King (right), seen here celebrating with her U.S. teammate and bronze medalist Katie Meili, won the 100-meter breaststroke over her rival, Russia's Yuliya Efimova. The meeting was highly anticipated, and it didn't disappoint — particularly from Lilly King's point of view. One day after King spoke bluntly about rival Yuliya Efimova's doping offenses, she beat Efimova to win a gold medal in the women's 100-meter breaststroke at Rio's Summer Olympics. "I'm proud to be competing clean and doing what is right," King said after the race. "But I need to respect the IOC's decision" — referring to the announcement over the weekend that Efimova would be allowed to compete. King's time of 1:04.93 set an Olympic record, as she gave the U.S. its first gold medal in 16 years in the women's 100-meter breaststroke. She won just after teammate Ryan Murphy netted his own gold medal and Olympic record in the men's backstroke. Efimova, the Russian who has been sanctioned for cheating, trailed just behind King at the finish line and narrowly edged King's teammate, Katie Meili, who won bronze. The win set off a new round of questions for King concerning her feelings about athletes who've been caught doping. When asked if she felt track star Justin Gatlin should be on Team USA in Rio, King didn't mince words, saying, "Do I think somebody who has been caught for doping should be on the team? No, I don't." When it was time for Efimova to address the media, she said she had paid a price for her actions. "I made mistakes and I was banned for six months," she said. "The second time was not my mistake." For King and Meilli, the result set off a celebration that King would later cite as part of the reason she didn't make a point to congratulate Efimova. "If I'd been in Yulia's position, I'd not want to be congratulated by someone not speaking highly of me," King said, adding, "If she was wishing to be congratulated, I apologize. She had a fantastic swim and I always look forward to racing her. I was just in the moment with Katie." Efimova was asked whether she regrets competing in the Olympics, given the boos that greeted her name in Rio. "I am just happy to be here. For me it was very hard to swim today, and this is three weeks it's been like crazy," she said. "Now I feel really happy as after everything, it is a good time and it's the best I can do right now." King's win came moments after Ryan Murphy's gold-medal win in the backstroke at the Olympic Aquatics Stadium in Rio's Barra da Tijuca district. And like King, Murphy shared his moment with a teammate: bronze winner David Plummer. For all of the American swimmers we've mentioned above, this is their first Olympics — just as it was for Kathleen Baker, who won the silver medal Monday in the women's 100-meter backstroke. Murphy won in 51.97 seconds, setting a new Olympic standard and updating a mark set by Matt Grevers at the 2012 London Summer Olympics. He also continued a streak of U.S. dominance in the backstroke, which Americans have won in the past six summer Olympics. U.S. Swimming also picked up a medal in the men's 200-meter freestyle, in which Conor Dwyer won bronze.